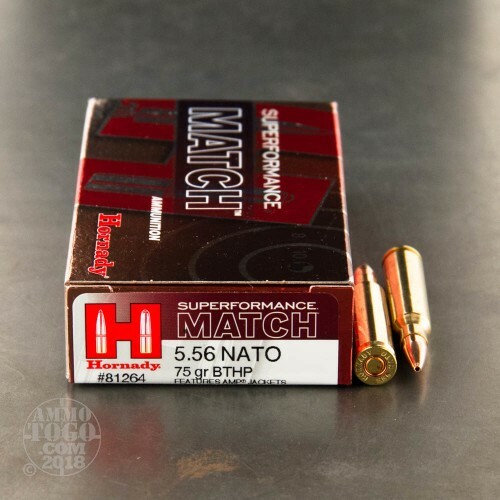 This is 5.56 Nato Hornady Superformance 75gr. Boattail Hollow Point Ammo. 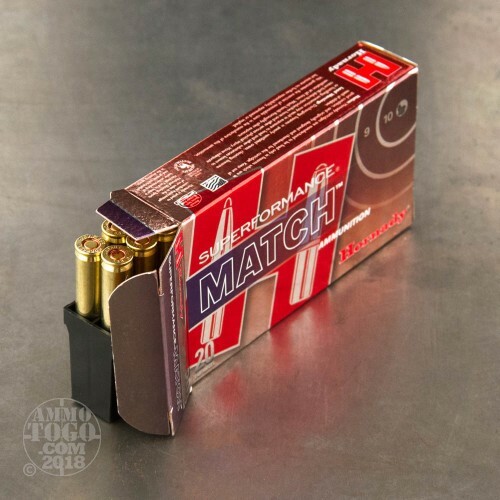 This is Hornady's new civilan load that is compared to the Law Enforcement round 8126N. This ammo's propellant technology is custom designed to enhance weapon operation, and delivers phenomenal temperature stability. 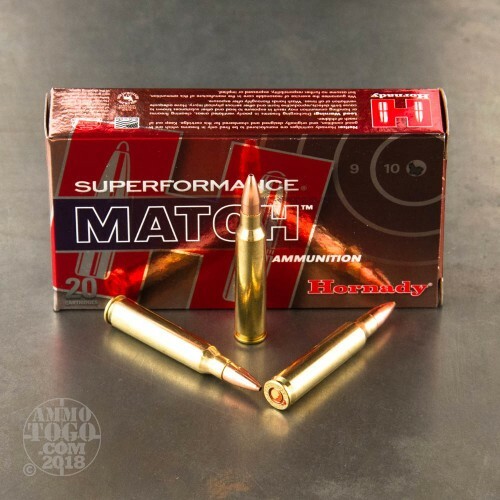 No conventional .223 load can match the Hornady 5.56 NATO performance. Many rifles chambered in 5.56 NATO are not realizing their full potential because they are shooting .223 Rem ammo. To get all the performance your 5.56 NATO can deliver, you need Hornady's high octane 5.56 NATO cartridge! 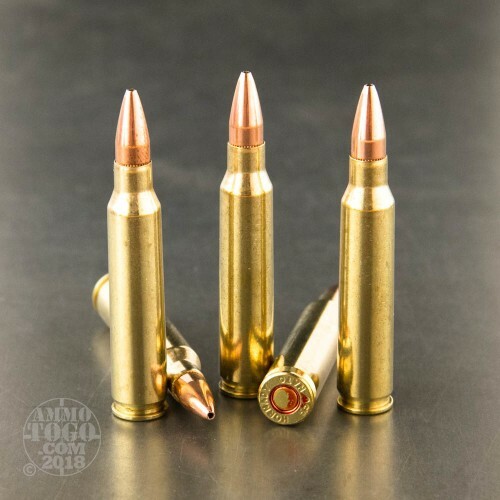 Your 5.56 NATO chambered rifle was designed to take advantage of the higher pressure of the 5.56 NATO cartridge — which translates to higher velocity, higher retained energy and harder-hitting performance. This ammo is loaded with Lake City brass with Nato cross. This ammo comes packed in 20rd. boxes. I recently purchased this ammo to test out on the range and for deer hunting. Normally I would be using a bigger caliber bullet and rifle such as my 300. Weatherby Magnum but decided that I will be using my Sig Sauer M4 5.56x45 rifle. Read the reviews on this ammo and from what I heard, it is great. Tested this out on the range and the grouping and trajectory of the bullet is good. I have yet to test this ammo out on my upcoming hunt. Great ammo, was not sure about a .556 for whitetail, but 1 shot per deer is all it took, 50 to 150 yards I did not matter, very accurate and deadly, I will be purchasing more of these for hunting. I was having accuracy problems with my heavy barreled 1/8 twist AR. This Ammo gave me the down range accuracy I was looking for. I use this ammo for whitetail hunting. I was looking for a heavier grain bullet that my son could use in my AR (1 in 7" x 16"). On a whim I took it myself on a quota hunt because I was letting a friend who was a first time hunter use my normal rifle (308). I hadn't confirmed zero on my others recently and the AR was the only legal deer gun I had that I knew was dead on. Long story short, a 4.5 y/o roughly 180lb 8 pt. came out at around 80yds and one well placed shot ended his wondering as quick as any long action gun I've ever seen. Blew my mind. I had questioned whether or not using an AR chambered in .556 was an ethical deer round and was really looking for coyotes since I had given my buddy my honey hole. Folks, this buck didn't jump or anything. He picked all four feet up to his body and dropped straight down. I've seen neck shot deer do that, but never a chest cavity shot. He died instantly. When I got him back to the truck and hung him up to field dress I found out why this had happened. First, there was no exit wound = 100% energy transfer. Second, there wasn't a piece of organ (any organ) bigger than a half dollar. I've taken probably somewhere around 150ish deer in my life and I have never seen anything like that. The shot was perfectly placed to avoid shoulder cuffs or blades, so I can't say what would happen if you tried to punch through the shoulder. If you prefer that type of shot, I'd do some ballistics through barriers checks before using it in the field. As for me, I won't hesitate to use this ammo again. Remember: aim, breath, squeeze. I have a short barreled carbine (10.5 in.) which means I cannot utilize the full potential of the excellent M-193 55 grain FMJBT round due to insufficient muzzle velocity out of the short barrel. Obviously I have to go with a heavier bullet to make my weapon platform effective. This is it. I also rely heavily on the Law E.nforcement Only-resAtricted version of this round (I'm LE) or the commercial MK 262 Mod 1 77 gr. (Black Hills) round but supplies of the latter two are sporadic at best. I have been able to procure a small supply of the Lake City MK 318 Mod 0 62 gr. OTM for testing as a potential replacement for the MK 262 but have yet to do so. Besides, the MK 318 is also sporadically available and not an improvement over the MK 262 logistically speaking. Anyway as long as this load is available, procuring anything else is irrelevant. This round is capable of far better accuracy than I am and while I have personally not been able to confirm terminal ballistic effects on a threat, I have no qualms whatsoever relying on it for defensive purposes.